Do you enjoy beer? How about beer and friends? 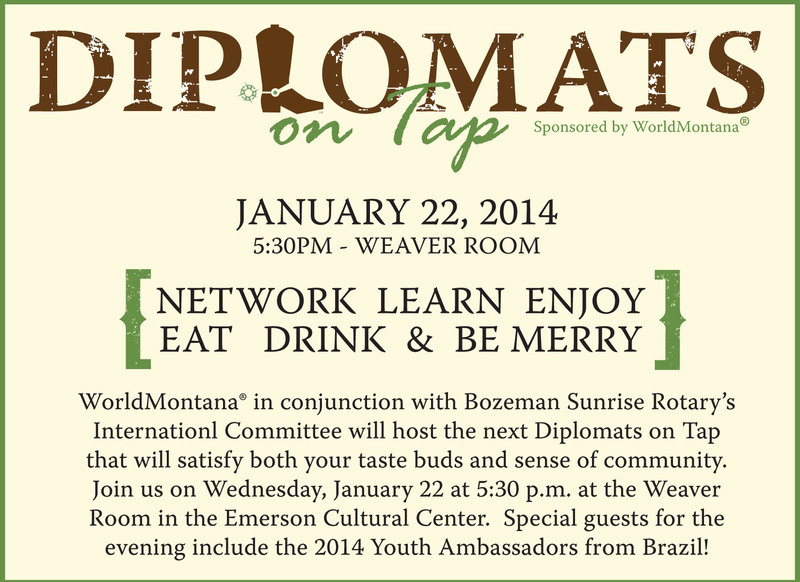 WorldMontana® in conjunction with Bozeman Sunrise Rotary Club’s International Committee will host its next Diplomats on Tap on January 22 that will satisfy both your taste buds and sense of community. This event will be an opportunity to allow Bozemanites to expand their knowledge of international issues. Quarterly, we hope to gather internationally-minded individuals to take part in a discussion about global issues, many of which affect us in some way. The January Diplomats on Tap will have special guests from the 2014 Youth Ambassadors from Brazil program. This Diplomats on Tap will include appetizers, wine and beer. Join us at the Weaver Room in the Emerson on Wednesday, January 22nd at 5:30 p.m. for an enjoyable evening.